Keep drinks ice cold for up to 36 hours (no, that is not a typo). You’re probably wondering how that’s possible. We certainly did. The answer is in the insulation. 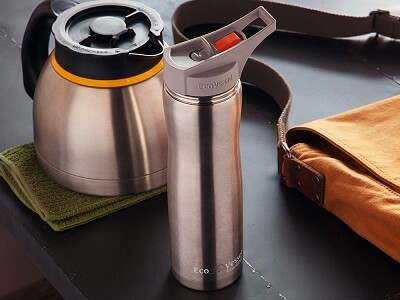 The Summit is triple insulated and made of premium stainless steel, free of BPA, phthalates, and liners. Perhaps just as impressive, the Summit is “sweat proof”—meaning that condensation won’t form on the bottle. Put it inside your backpack or lunch bag without fear; the other contents will stay dry. Or if you’re traveling by car, the bottle fits nicely inside most cup holders. And speaking of being on the go, you can flip up the integrated straw with one hand and take a refreshing swig. The top’s loop handle makes it possible to carry the Summit with a few fingers, if needed. Summit’s ergonomic body is pleasantly curved for a better grip. The straw removes easily to pour or sip straight from the bottle. It makes cleaning simper, too. With this bottle, there’s certainly a lot to drink to. My name is Nate Etter, Director of Sales at Eco Vessel, and it's exciting to be featured on The Grommet! We are an innovative bottle company based in Boulder, CO and pride ourselves on making reusable, eco-friendly products for the whole family. We donate 1% of all sales to the non-profit Water For People helping to provide clean water for people around the world. 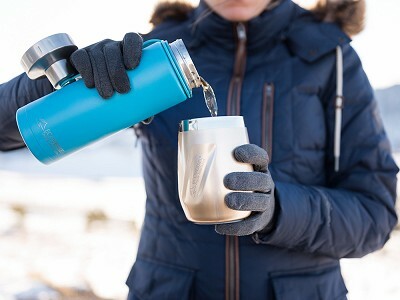 The Boulder bottle featured today includes our TriMax triple insulation technology that has been tested to keep drinks hot up to 8 hours and cold up to 36 hours. 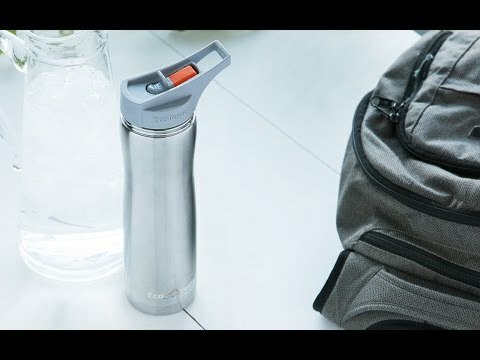 The bottle also has a built-in tea strainer and a convenient screw-top with a wide opening to easily accommodate ice and a narrow spout for drinking. What other questions do you have about Eco Vessel or our bottles? This is an incredible product! I can't say enough good things about it. It really does keep things cold longer than anything else I have ever used. Buy it! You won't regret it. Oh, thanks Kai. So glad when we see Grommet advocates on here. Yup the whole bottle is made of stainless steel but the founder will be able to tell you if there is another material at this specific spot on the bottle. @Amy @Heather. The spout where you drink from is actually very hard plastic (polypropylene) so that it won't get too hot or cold. This is wrapped in a layer of stainless steel. The body of the bottle is 304 food grade stainless steel. @Kevin G. If the bottle comes in two different colors, are these powder coated onto stainless? @Kevin G. the black and white bottles featured here are both powder coated onto the stainless steel. The bottle also comes in silver (just the stainless steel), blue, pink, purple, green (powder coat), and red on EcoVessel.com. I was wondering if the 17oz bottle would fit in a road bike water bottle brackets. @Vidas the 17oz Boulder is slightly too large to fit into most bike cages. The bottle has a 3 inch diameter. @Nate, Any plans for a bike-cage capable bottle? There's a real gap in cold water transport for bikes. I used a typical soft plastic squeeze bottle for years (maybe 40 minutes cooling), then moved to an insulated one (maybe 90 minutes). Recently, I picked up a Thermos bottle that fits, at the same price point as yours, but only about 1/2 the cooling time, and not recommended for hot beverages (for those off-the-bike excursions). @Verb we are aware of the need for a truly insulated bike bottle and have worked on some prototypes. Nothing is finalized at this point but we appreciate the feedback and will likely enter the bike market in 2014. @Bill great idea! We will likely move into the bike market to some extent in 2014. I would like to know if this bottle "sweats". my son puts his water bottle in his backpack outside pocket and some bottles have so much condensation on the outside that his things get wet inside the backpack. Does this bottle stay completely dry on the outside? And does it get cold or hot on the outside? @Shari the Boulder bottle is completely sweat-proof and leak-proof due to our TriMax triple insulation technology. Your sons backpack will be completely dry! Where is the bottle manufactured? This bottle is manufactured in China. @simon the filters in our Aqua Vessel line of filtration bottles are made in the USA and we also make biodegradable squeeze bottles domestically, but to our knowledge there is nowhere in the US to manufacture double-wall high-quality stainless steel bottles. We value American made products as a company and try to create as many products as we can in the USA (like the silicone in our upcoming glass series). Everything about this product is amazing, but I am extremely disappointed that it is made in China. Sorry, but will keep me from buying it. Is it easy to get the spout and top part really clean? @Guest The spout of the Boulder is easily removable and even easier to clean. All parts can be reached and easily hand-washed. Does the liquid inside end up having a metallic taste? @Guest Nope! Unlike aluminum and other metal bottles that use chemical liners, our 304 stainless steel bottles are food grade and have no additional chemicals or liners. All you will taste is fresh, ice-cold water. Can it be washed in the dishwasher? What is the outside layer of the bottle? @Gail We recommend hand-washing the bottles mostly to avoid any damage to the paint or logo under high heat. The outside of the bottle is 304 food-grade stainless steel. I purchased a stainless steel bottle once before and found it had a taste in the water after the water sat in it for a while. a metallic taste. I was wondering if yours has that problem too and if you say no, why not? thank you for answering! @simon our bottles will not have a metallic taste because we do not use any chemical liners and 304 food-grade stainless steel will not leach. Is it possible to obtain in a 32 oz. size? Often a 2 cup capacity is not enough when taking long walks or just doing projects for the day away from home. Love the idea of this Eco Vessel. @Sylvia great point! Our screw-top Boulder bottles come in a 17oz and 25oz model. 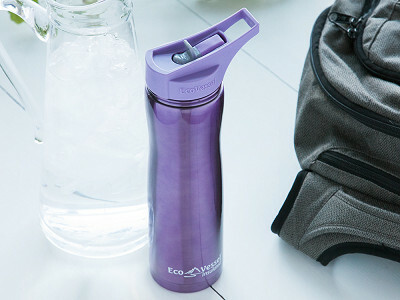 We also have a 45oz insulated bottle called BIGFOOT that can be found on www.ecovessel.com. The Grommet is offering the 17oz Boulder, our best-selling size. @kim let us know what you think! I think you'll love it. How much does the 17 ounce bottle weigh (prior to filling, of course). Thanks. @Roberta the bottle weighs 13 oz prior to filling. There's a little bit of a discrepancy on the duration of time for keeping contents hot/cold. 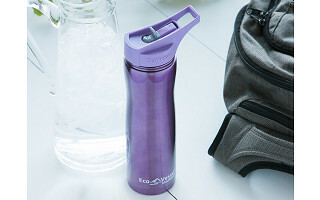 Nate, the Director of Sales for Eco Vessel indicated that the bottle has been tested to keep drinks hot UP TO 8 hours and cold UP TO 36 hours. But the advertisement says "The Boulder by Eco Vessel has been tested to keep water cold for MORE THAN 36 hours (no, that is not a typo) and retain heat for ABOUT 12 hours." So which is it? @Guest great question. We have tested the Boulder bottle many times against other leading brands and our insulation outperforms them all. In our official packaging and marketing, we feel confident saying the bottles will keep drinks cold up to 36 hours and hot up to 8 hours (sometimes much longer). These numbers are obviously relative to what you consider hot and cold, so the most important point to make is that it will keep your tea and coffee hot through the heat of the day and will keep drinks ice cold for over a day. I often recommend not filling the bottles with ice because it will take so long to melt.